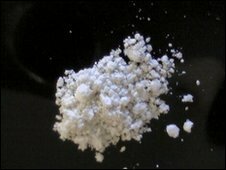 Anti-drugs campaigners are warning primary school children and their parents of the dangers of so-called legal highs. It follows a number of suicides linked to the substances in the south-east Antrim area. The anti-drug activists plan to take their campaign into schools across Northern Ireland. Campaigners said hundreds of legal highs are being sold in head shops and over the internet. Teenager Rian Gault from Carrickfergus is a former drug user. She believes even very young children need to know the dangers. "There's secondary school kids selling it to the primary school kids. "People selling it in parks to children as sugar, hoping they'll get addicted and they'll come back to this person and they'll keep on getting it again and again and again."